Clackmannanshire council, Scotland; caused by the resignation of Scottish National Party councillor Phil Fairlie who had served since 2017. The deputy leader of the council, Fairlie is resigning for personal and professional reasons; away from the council he is the Scottish chairman of the POA, the trade union formerly known as the Prison Officers’ Association. For our Scottish poll this week we are in the Wee County of Clackmannanshire, one of the many tiny counties which the Middle Ages left Scotland with; subsequent waves of local government reform have swept most of them away, but Clackmannanshire remains intact. With a population of just over 50,000, it is the smallest local government district on the Scottish mainland. 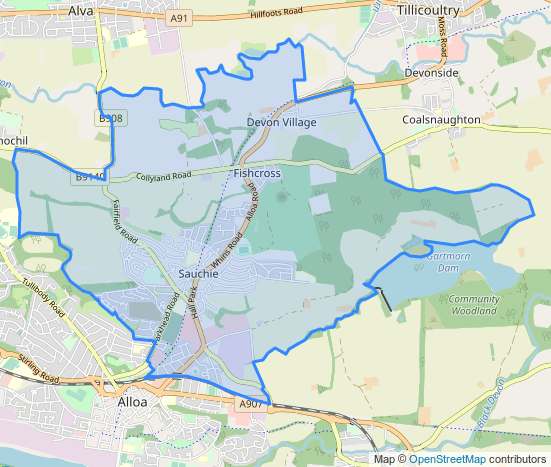 The Wee County’s Central ward is based on the northern end of the town of Alloa together with the villages of Sauchie and Fishcross to the north. Alloa railway station, opened in 2008 and recently electrified, lies on the ward’s southern boundary and links the area to Stirling and Glasgow. The county town of Clackmannanshire, Alloa is an industrial centre particularly associated with the brewing industry; while Fishcross is a former mining village. Sauchie is perhaps best known as the birthplace of Alan Hansen, the former Liverpool and Scotland defender who later served for many years as a pundit on Match of the Day; Hansen learned to play the beautiful game with the local youth side Sauchie Juniors. Clackmannanshire has long been one of the stronger areas for the Scottish National Party, who have held the Scottish Parliament seat covering the county since 2003 and had a near-miss at the inaugural Holyrood election four years earlier. However, the parliamentary seat covering Clackmannanshire (currently Ochil and South Perthshire) remained with Scottish Labour until their collapse following the independence referendum of 2014. The Central ward was created some years before that poll in 2007, Labour beating the SNP 57-37 in votes and (this being Scotland, where they use proportional representation) 2-1 in seats; in 2012 the Labour lead narrowed to 49-41 but the seat count remained the same. By the May 2017 local elections the context had changed, the SNP having gained Ochil and South Perthshire in their 2015 landslide; but the Nationalists couldn’t translate this into a seat gain in Clackmannanshire Central. Labour remained on top in the ward with 40% of the vote, and the SNP remained second with 38%; however, the drops in both parties’ vote shares were to the benefit of the Conservatives, whose 17% was enough for them to gain the final seat in the ward off Labour. Both Labour and the SNP had piled lots of votes on their lead candidates, and better balancing by either party would have shut the Tories out. The Conservatives followed up on that by gaining the Ochil and South Perthshire parliamentary seat in the general election five weeks later, although one suspects that this is not the strongest area of the constituency for them. This by-election will be an SNP defence, and could be crucial for control of the council. The party runs Clackmannanshire as a minority, with 7 out of 18 councillors plus this vacancy; Labour have 5, the Tories 4 and the remaining seat is held by an independent. The defending SNP candidate is Jane McTaggart, who runs a social enterprise in the area and fought Clackmannanshire East in the 2017 elections. The Labour candidate is Margaret Brookes, who is described as a Sauchie community stalwart; given the Labour lead here two years ago she probably starts as favourite, particularly if she can pick up Unionist transfers from the Conservatives. The Tories have selected William Marlin, who works for his family’s manufacturing business. Completing the ballot paper are Marion Robertson for the Greens, John Biggam for the Liberal Democrats and Dawson Michie for UKIP. A quick reminder that this is a Scottish local by-election, and so Votes at 16 and the Alternative Vote apply. Sutton council, South London; caused by the resignation of Liberal Democrat councillor Joyce Melican who had served since 2014. She is resigning on health grounds, having suffered a stroke while on holiday abroad. We travel south for our other by-election this week, which is in the seat of the longest-serving Liberal Democrat MP. Tom Brake is one of three MPs from the party who were first elected in 1997; however, he is the only one of those with continuous service, as Vince Cable and Ed Davey lost their seats in 2015. 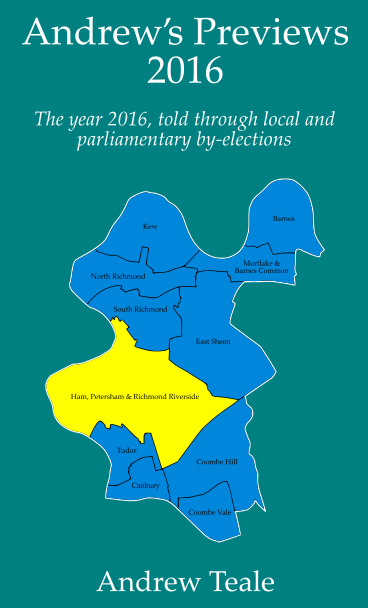 Appropriately, Brake’s seat of Carshalton and Wallington is in the local government district with the longest continuous Liberal Democrat majority: the London Borough of Sutton. This is an area of London outer suburbia created by the railways. Wallington railway station opened in 1847 (originally with the name “Carshalton”) on the Victoria-West Croydon-Sutton line in an agricultural area which specialised in lavender cultivation. By the outbreak of the First World War the lavender fields were gone, replaced by Victorian and Edwardian villas which, for the most part, still exist today. 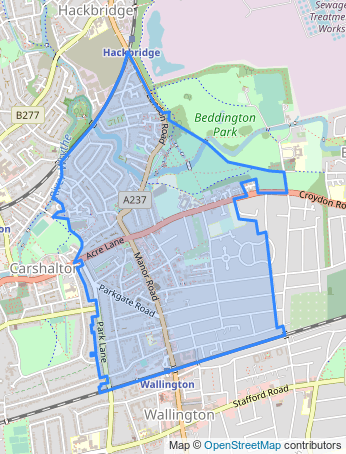 The Wallington North ward lies to the north of the railway line, and includes a remaining area of open space: the Grange Gardens, a public park in the Wandle valley. For much of this century Wallington North has been a Liberal Democrat-held ward of Sutton council with the Conservatives close behind and not far off winning a seat. The 2016 London Assembly elections, however, showed a rather different picture: Zac Goldsmith carried the ward’s ballot boxes with 40%, to 29% for Sadiq Khan and 15% for Lib Dem mayoral candidate Caroline Pidgeon; while an unusually-fragmented London Members ballot had 29% for the Conservative list, 22% for Labour, 21% for the Lib Dems and 13% for UKIP. So it must have been disappointing for the Sutton Tories that the 2018 election here saw a big swing to the Liberal Democrats, while elsewhere in the borough the Tories were gaining nine seats and doubling their Sutton council group. Shares of the vote in Wallington South last year were 46% for the Liberal Democrats, 26% for the Conservatives and 17% for Labour, which was a 6% swing to the Lib Dems compared with 2014 (when they had 34%, the Tories 26%, UKIP 20% and Labour 12%). Defending for the Liberal Democrats is Barry Lewis, a long-standing Scout leader and businessman in the travel industry; that latter aspect has attracted adverse comment from other candidates after the Inside Croydon blog reported that two companies associated with Lewis have gone into liquidation with debts running into millions of pounds. The Tories have reselected Charlotte Leonard who was runner-up here last year; she is a corporate fundraiser for an international development charity. Labour have selected a candidate with local government experience in Sheila Berry, who was an Epsom and Ewell councillor until 2015 (under her former name of Sheila Carlson); she was Mayor of that borough in 2011-12, and was the Labour candidate for the Epsom and Ewell constituency in the 2015 general election, coming second to international laughing stock Chris Grayling. Completing the ballot paper are Verity Thomson for the Green Party (who stood here last year), John Bannon for UKIP, Ashley Dickenson for the Christian Peoples Alliance and independent candidate Gervais Sawyer. Andrew Teale edits the Local Elections Archive Project, sometimes tweets at @andrewteale and plays quiz a bit. Read his meticulously-researched previews for the full lowdown on each local by-election, what you need to know and why you might (or might not) want to visit. © 2019 Britain Elects. Founded by Ben Walker and Lily Jayne Summers.